The compact Synclavier II (pronounced Sin -cla-vere 2 in USA and Sin- cla-vee-er 2 in Europe - but we all shorten it to 'Sync 2' which is pronounced the same everywhere) real-time performance system consists of a keyboard unit, the Digital Synthesiser (which contains a computer and the digital synthesisers), one or two disk drives, various connecting cables, and the software that is stored on floppy diskettes. 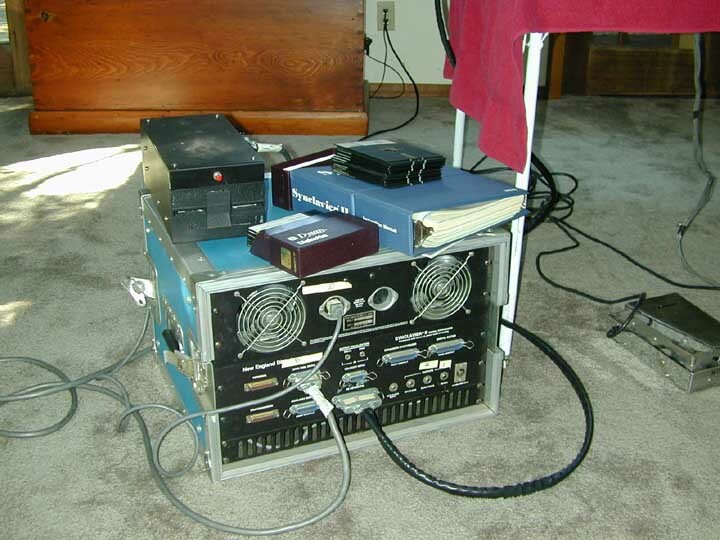 A picture of the Sync II Control Unit. The keyboard unit is designed for ease of use and speed of operation. The control panel above the keyboard is used to control precisely the 'timbre' of the notes triggered by the keys as well as to operate the 16-track digital memory recorder. The control knob and digital display window are located on the left of the panel. The rest of the panel consists of four groups of buttons, all logically organized and clearly labelled according to their musical functions. The memory recorder buttons are located in the centre for heavy use during performance, the timbre control buttons are located on either side, and the buttons for transfer of information to and from the diskette are located on the far right. In contrast to analog synthesisers, which have a separate knob for each function, the Synclavier II requires only one control knob for all of its functions. You use it to make changes in timbres, to adjust the keyboard range and establish non - Western scales. During operation of the memory recorder, you use the knob to separately adjust playback speed or tuning. You can even use the control knob for performing pitch bend. The digital display window provides an instantaneous visual readout of all the changes that you make with the knob. When you begin operation, the window displays the number of voices in your system. When you recall a timbre from the diskette, the window displays the number of voices used by the timbre. During recording, it displays the beat of the digital metronome and the number of notes you have left in the memory recorder. From time to time, the window will also display various error messages. No matter what function you are changing, the control knob always works in the same way. It is a spring-loaded knob and can be turned from about an 11 o'clock position to the left, to 1 o'clock to the right. When you turn the control knob to the left you decrease the number in the window, likewise you increase the number when you turn to the right. The farther you turn the knob, the faster the number change. Whenever you release the knob the number currently displayed in the window will be memorised by the computer and will remain in effect until you change the setting or turn off the system. These buttons are used along with the control knob to program the foundation of each timbre. You use them to adjust the harmonic content of the timbre and its volume during the attack, sustain and decay portion of the note. Both Volume Envelope (VE) parameters and Harmonic Envelope (HE) parameters are included so that both loudness and harmonic content can be programmed to vary during a note. You use the buttons in this panel to operate the Synclavier II polyphonic memory recorder. You can record and play back a sequence of up to 10,000 notes with up to 16 different timbres and can modify the sequence in many ways. You use the buttons in the third panel to enrich and musically modify the timbres and to create special keyboard and real-time effects. When you want to recall a preset timbre from a diskette or store a new timbre, you use the buttons in the upper fourth panel. To store or recall an entire recorded sequence of notes along with their associated timbres, turn to the buttons on the lower fourth panel. 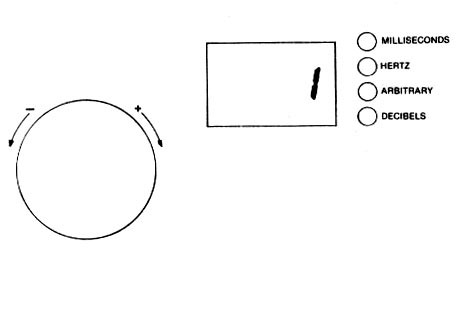 Storing or recalling timbres or sequences takes place almost instantaneously. Also located in this panel are several buttons that allow you to control external voltage-controlled filters or any other voltage-controlled equipment. The buttons can be divided into two general categories: Those that change the digital display - Knob Buttons - and those that do not -Function Buttons. Knob buttons are used to designate a particular function for the control knob. When you press a knob button, such as volume ATTACK or recorder SPEED, a setting will appear in the digital display window. You then use the control knob to dial a change in that setting. Function buttons do not affect the control knob or the digital display. They are used for a variety of purposes, such as choosing a timbre for the keyboard, selecting a track for recording, or turning the portamento function on or off. 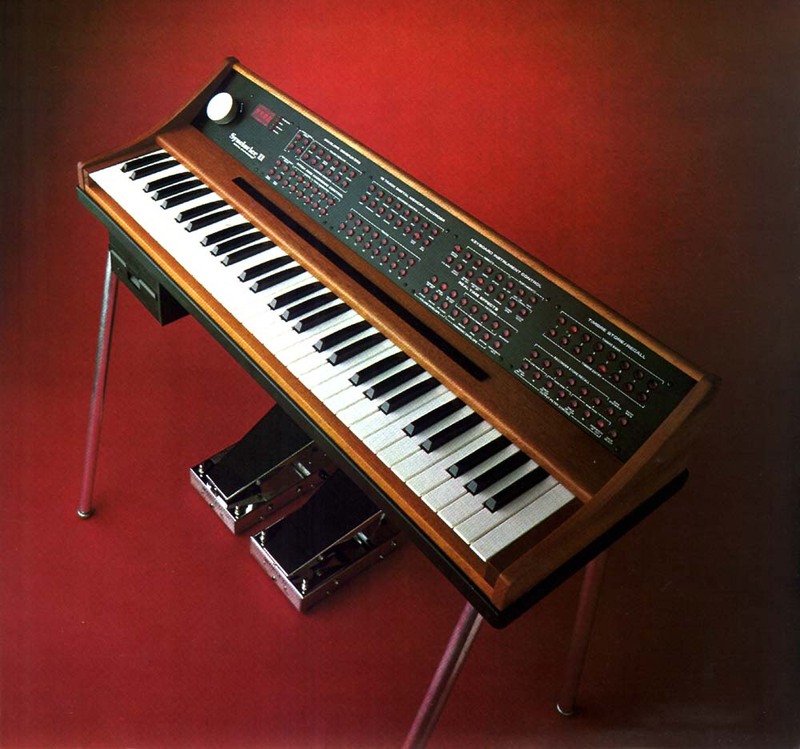 The Synclavier II Digital Synthesiser contains the computer that controls the system and the digital synthesisers that produce the actual sounds. A computer used for music synthesis must carry out a tremendous variety of jobs instantly and simultaneously. New England Digital's 16 bit ABLE computer more than fulfills the requirements for professional synthesis and performance. The power of the ABLE computer is based on its architecture, which allows high-speed access between 32,000 and 56,000 16-bit words of memory, depending on the number of memory boards in your system. The highly efficient architecture also permits the control of a complete and complex real-time operating system by a single processor. This greatly simplifies the programming system. 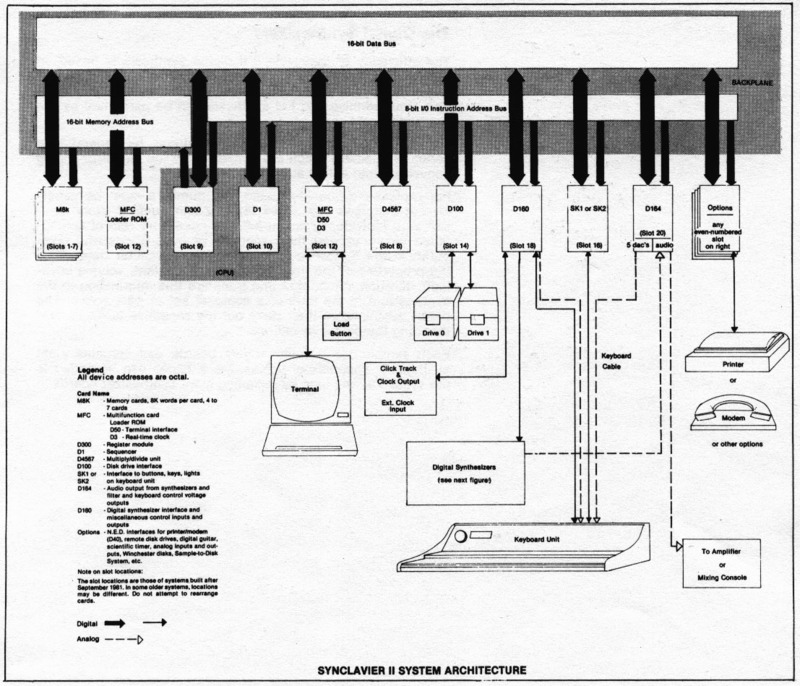 The language used to program the system, Scientific XPL, is a high-level structured language. New software modules can be, And frequently are, added to the system software without the need to reprogram the original operating system. The ABLE computer is one of the very few computers in the world specifically designed to operate with compiler-generated software. This designed-in compatibility is a major reason for the combination of power and affordability in the Synclavier II system. The large amount of memory in the Synclavier II computer allows you to perform and record multitrack, polyphonic musical sequences. Low cost expansion memory boards can be plugged in at any time. 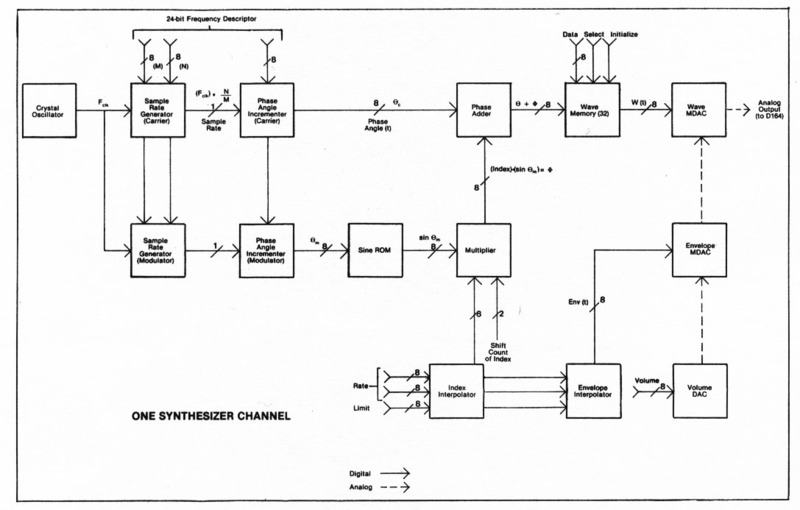 The efficiency of Synclavier II Digital Synthesis is based on patented technology. High frequency resolution provides for glitch-free portamento and vibrato and prevents alias distortion. Both additive and FM synthesis can be performed by the Synthesisers. The digital synthesisers produce waveforms by generating a series of numbers which are converted by the digital-to-analog convertors into actual waveforms. For professional quality sound the numbers must be generated a extremely high rates (32kHz minimum). In the Synclavier II system, the computer determines the properties of the note (its harmonic content, volume envelope, duration, pitch, etc.) and transfers this information to the synthesisers in the form of a compact set of parameters. 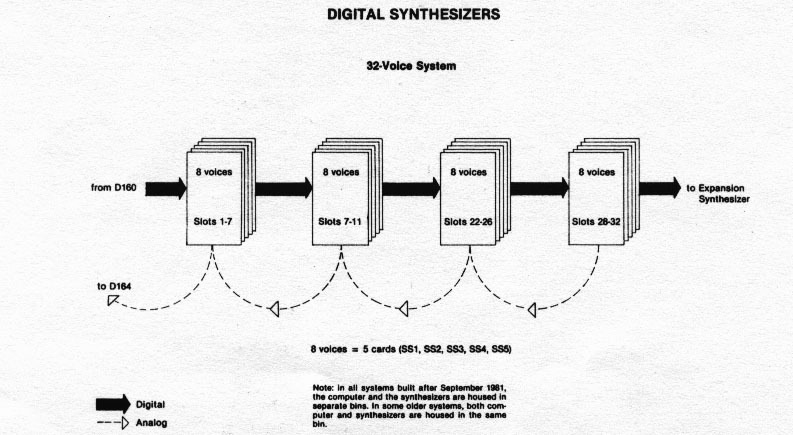 The digital synthesisers then carry out the repetitive tasks of synthesising the digital waveforms. Each synthesiser is built on five boards and contains eight synthesiser channels or voices. More voices can be added to the system at any time by installing more synthesiser boards.